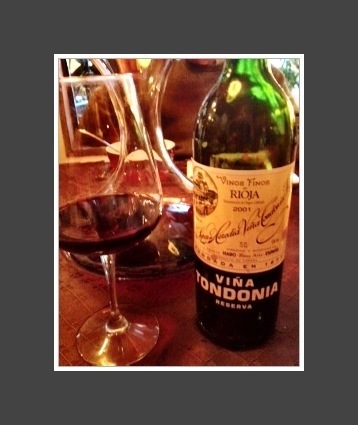 Viña Tondonia, Reserva, López de Heredia, Rioja Alta, Spain, 2001, 12.5% abv. It was a small miracle of a find – bottles of López de Heredia at the liquor store on sale no less. My happy day was due to someone ordering in a case and then reneging. Who does that to a case of Tondonia? Out it came for a dinner of homemade chilli, fresh salad greens and breads. Comprised of Tempranillo (75%), Garnacho (15%), Graciano and Mazuelo (10%) all from the López de Heredia vineyards, it was clear and bright, medium plus ruby with legs. On the nose, clean with medium plus intensity and aromas of apple pie, cinnamon and baking spice, ginger, clove, black pepper and blackberry. I know – you’re thinking, ‘Apple pie? She’s off her rocker.’ But the aroma was unmistakeable. The palate was dry with medium plus acidity, smooth tannins with the tiniest bit of grip, medium alcohol and medium plus intensity with flavours of ripe, red Macintosh apples, spiced apple pie, damson plum, blackberry and cassis. Alongside was a lingering black pepper, baking spice, sweet tobacco and light leather. The finish was long. This unfiltered wine was aged 6 years in barrels before bottling, racked twice a year and fined with fresh egg whites. WSET Outstanding wine – the fruit and complexity were layered, intense and exciting with the apple pie, spice and blackberry. Considering the acidity and tannins, it’s possible for this wine to be aged even a little longer although López de Heredia recommends 10 years optimal. This entry was posted in Graciano, Grenache / Garnacha, Mazuelo, RED, Tempranillo. Bookmark the permalink.